GLORIA is based on a flexible concept tailored to support different scientific scenarios and aims. 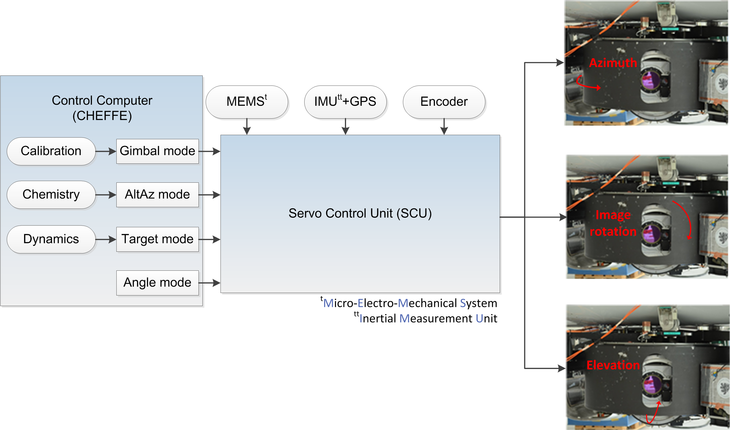 The control system enables nadir and three different limb view acquisition modes: Calibration, Chemistry (high spectral resolution) and Dynamics (high spatial resolution, tomography) Mode. 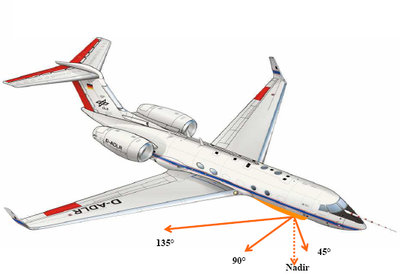 A 3-axis compensation of aircraft movements and other noise sources is mandatory. Precise pointing is required as the target points are quite far away (up to 350km) and small angle errors of the instruments cause large offsets of the tangent points. There are high vertical intensity gradients especially in the case of clouds. Stabilization errors can produce artifacts in the interferogram. Thus, during the acquisition times of a few seconds a good stabilization is essential. Information from the different sensors (GPS, IMU, MEMS, and encoder) are fused in order to acquire precise pointing.